→ Symphony -- Eversharp's Last Good Pen? Thanks, Teri, for an informative "expose" of one of my favourite Eversharps. I have a couple variations of the 900-series which I think I got from you. Keep up the great work. I have several Symphonies...never knew the model numbers...just the rough sequence: (1) Slipper cap, (2) banded tassie, (3) Crudely cut bottom of the cap, but still a "gold" plated cap (4) Plastic cap and barrel. My "slipper cap" has a rubber/plastic sleeve extending below the cap that keeps it posted securely. The all plastic -- 713?-- also posts. The caps on the others tend to wobble when posted, as if the barrel has gone slightly out of shape over the last 60 years. Depends upon what you mean by "good pen." The pen that later became the Parker 45 was a late Eversharp, and some of them were sold with Eversharp branding. 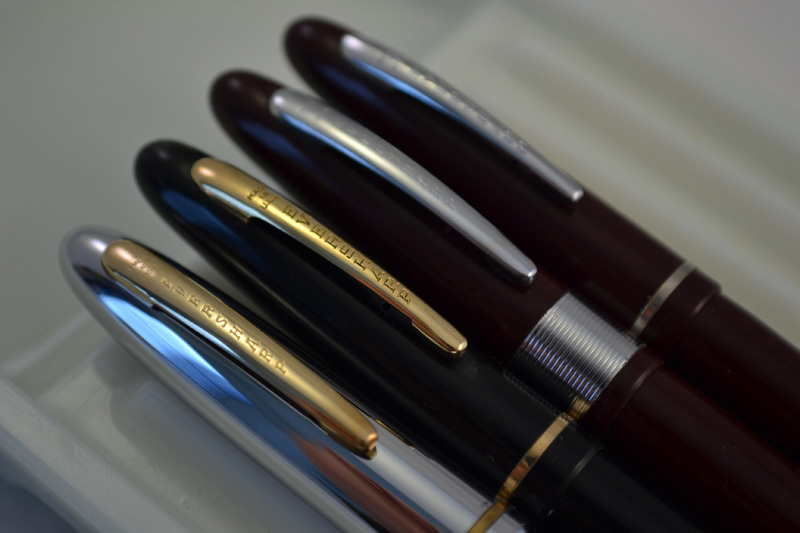 Although I much prefer the 51 to the 45, many here at FPN would consider the 45 a good pen, even if not a top of the line luxury good pen. I own a UK Parker 45, the TX, and it is good for both looks and smooth writing, even if nowhere near the equal of my 51s. And some of us would disagree, considering the 45 equal to or better than. Use medium or broad nibs, I say to those people. Forming an opinion of the 51 from a randomly acquired example with a fine nib is not, for me, giving the pen a chance. Warping is a big problem with the plastic used on these .... we found a lot had a rather banana-y shape to them. I suppose what I meant by good pen was one on the collectors' radar .... the 45 was a good pen, but of not much interest to collectors (yet).